CABLE HIGHLIGHTS: As the pre-bowl COLLEGE FOOTBALL season nears its end, games and related programming dominated the Top 10, with ESPN’s Michigan State vs. Penn State game the highest-rated at 1.04. (Although it’s only on the chart because HBO insists on listing its theatrical movies as “originals,” the 0.86 for BATMAN V SUPERMAN is also notably solid .) Hallmark changed things up slightly with a Hallmark Hall of Fame-branded movie (we don’t have the title) at 0.68. Univision again hit the Top 10 with a LIGA soccer match at 0.43. The Adult Swim late-night animation block was as follows: DRAGON BALL Z down 0.01 to 0.54/1.205M, JOJO’S BIZARRE ADVENTURE down 0.02 to 0.40, MOBILE SUIT GUNDAM steady at 0.35, HUNTER X HUNTER up 0.02 to 0.34/714K, NARUTO up 0.03 to 0.32/685K, ONE PIECE up 0.02 to 0.28/607K, and ONE PUNCH MAN up 0.01 to 0.29/609K. HBO’s BOXING telecast, rated in fragments as always, was at 0.30/0.27/0.26/0.23. HGTV’s HOUSE HUNTERS RENOVATION ticked up to 0.30. Fox Sports 1’s UFC FIGHT NIGHT was at 0.27, with the PRELIMS at 0.23. The morning block on Food Network had KITCHEN AT FN down 0.04 to 0.23, PIONEER WOMAN at 0.22, TRISHA’S SOUTHERN KITCHEN at 0.18, AYESHA’S HOMEMADE at 0.18, and VALERIE’S HOME COOKING at 0.17. 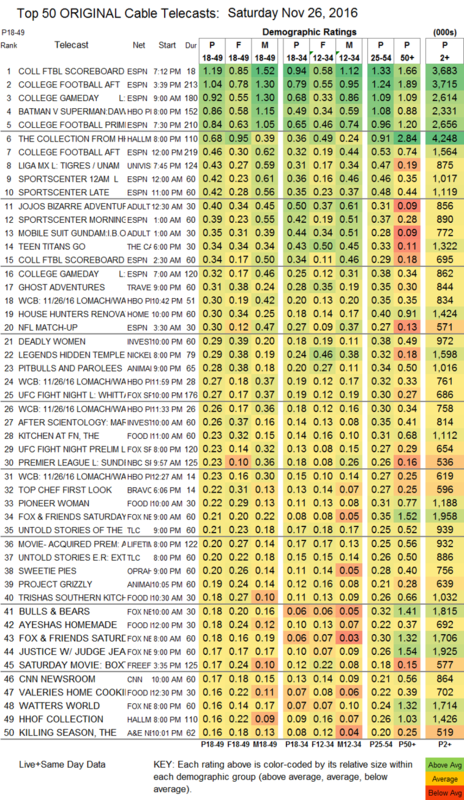 TLC’s UNTOLD STORIES OF THE ER was at 0.21/0.20, down from last week’s 0.26. BBCAmerica’s DIRK GENTLY’S HOLISTIC DETECTIVE AGENCY rebounded by 0.03 to 0.08.